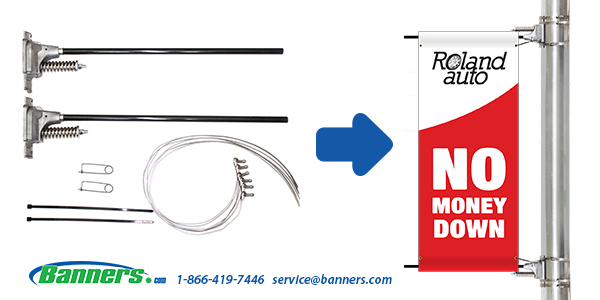 You can now order double sided pole banner bracket systems online! Visit our double sided pole banner page to get started on your order. The standard bracket system can be used indoors or outdoors. 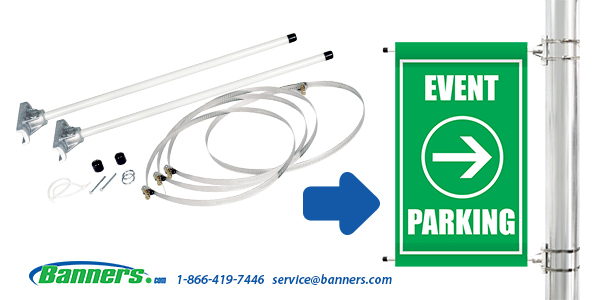 It is commonly used for short term events where banners are switched out often. The arm brackets are stationary and are not designed to flex. The wind deflecting hardware is the best choice for long term outdoor applications. The arms and springs of the brackets are engineered to properly disperse wind load by flexing with strong winds. If you are planning on having your banner displayed for a long period of time, we strongly recommend spending the extra money on this bracket system so you don't have to replace your banner. Visit our double sided pole banner page to get started on your order.